Product prices and availability are accurate as of 2019-04-17 13:46:51 BST and are subject to change. Any price and availability information displayed on http://www.amazon.com/ at the time of purchase will apply to the purchase of this product. How To Protect Your Knees & Enhance Your Workouts At The Same Time? With Sleeve Stars Knee Braces Of Course! Remember not being able to finish that last set of sumo squats? Remember that gnawing pain when you jog or run? Remember all those cheaply made knee braces with mediocre support? Well, prepare yourself because you are about to forget all of the above with our neoprene knee stabilizer. This open patella brace will leave your kneecap a little bit uncovered, thus making its wearing comfy for extended use! 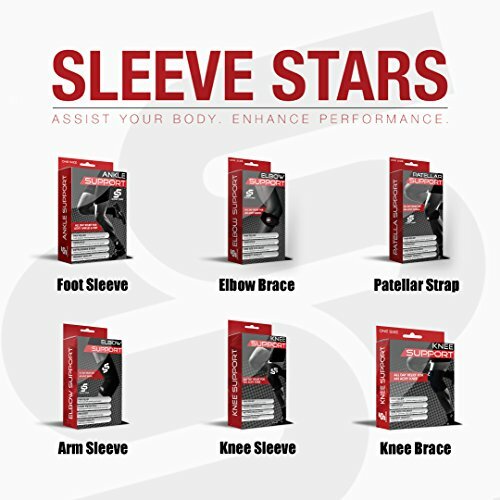 Wrap, Adjust, Protect & Go - Working Out Is Fun & Safe Again With Sleeve Stars Knee Braces! Ohh, those knees... They endure more strain than many other joints, as they support your body's entire weight. The continued stress and sudden impacts on your knees can damage the cartilage, tear ligaments, and lead to pain or even injuries. Combining an optimal compression knee support, adjustable straps and a comfy fit, this knee brace is here to accommodate even your most demanding needs. Perfect for any knee related issues. From simple knee pains, muscle stiffness, and meniscus tear, to arthritis, acl, pcl, and injured ligaments! FOR ALL SPORTS & ATHLETIC ACTIVITIES: This knee support brace is ideal for all kinds of injuries like Arthritis, Meniscus Tear, Mcl, Lcl, Acl, Pcl, Patella tracking, Tendinitis, Osteoarthritis, Chondromalacia, Osgood-Schlatter Disease and Jumpers knee. Helps relieving severe pain when doing sports like basketball, football, volleyball, running, lunges, jumping jacks and squats, weight lifting, CrossFit, yoga, hiking, and so many more. ALLEVIATE KNEE ACHES & PAINS: Struggling with painful persistent knee aches and acute pains from past injuries or intense workouts? 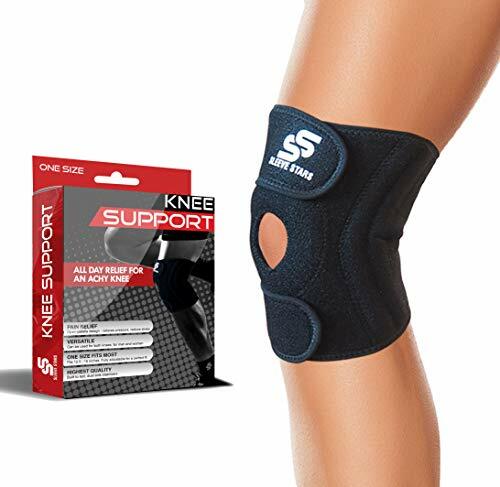 If so, then this knee pain relief brace with open patella is here for you. It's made to relieve knee pain and our patellar brace doesn't rest until the job is done! Place it around your knee, ease pains, relieve muscle soreness, facilitate your gym sessions, and feel confident about yourself again. QUALITY MEETS COMFORT: Made from high-end quality neoprene you may rest assured that this knee sleeve is ready for some heavy duty use. Thanks to its breathable and moisture wicking fabric, and dual side stabilizers for ultimate protection, this knee brace will provide optimal support and endless comfort while wearing. Enjoy better range of motion and enhance your movement. 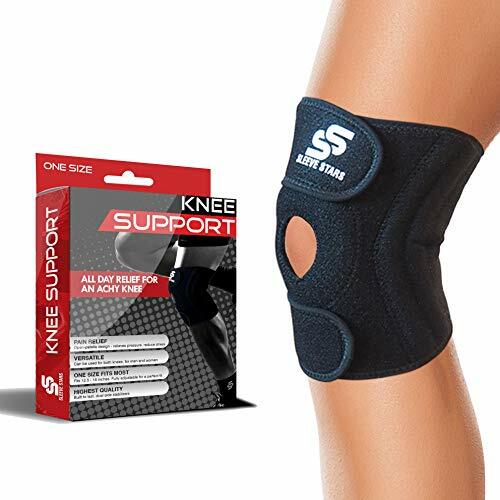 Suitable for men, women and kids with knee injuries, pains or even arthritis! Fits knees between 12 - 21 inches. CONFORMS TO YOUR NEEDS: Designed with your best interest at heart, this compression knee brace is extremely easy to use. Just wrap it around your knee, use the 2 convenient straps to adjust it as much as you want, achieve the perfect fit and enjoy. No more knee wraps sliding down your legs, no more bulky braces ruining your athletic performances either! KNEE PROTECTION ON THE GO: Looking for the best knee brace on the market? Well, here it is! 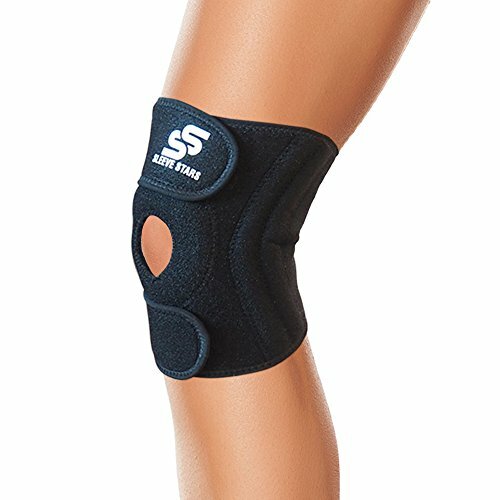 If you are leading an active lifestyle or happen to suffer from meniscus tear, a highly supportive patella knee brace like this is an absolute must have. Wear it over clothes or directly around your knee cap area and keep it protected and compressed. Do not let knee soreness gain over. Now, you are in charge!